16 cm. 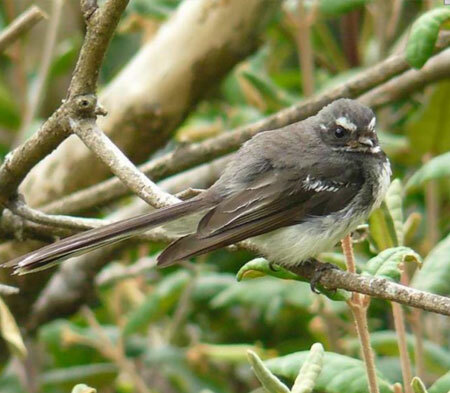 Small acrobatic fly-catcher, grey with white ‘eye brows.’ It spreads its fan while swooping from tree to tree. Voice: A busy scissory chatter and a short sharp ‘jeck’. Both 10 cm. 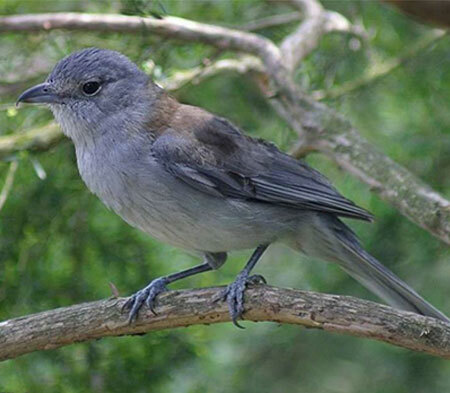 Almost the tiniest and most common birds in the reserve. They both have lovely markings and variations of colour as you can see here. They are busy little birds, always foraging for insects in the trees. Voice: Brown a soft churring or a short, sharp ‘tsip tsip’; Striated a sharper ‘tizz,tizz’. a sociable visitor when we are weeding, hoping for worms or insects to surface. A running, piping call. 27-33 cm. Smaller than the above, no red wattles. 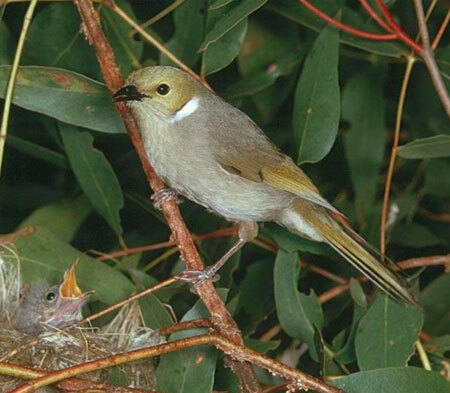 Voice: Similar call – more ‘kwock’ – and flight. 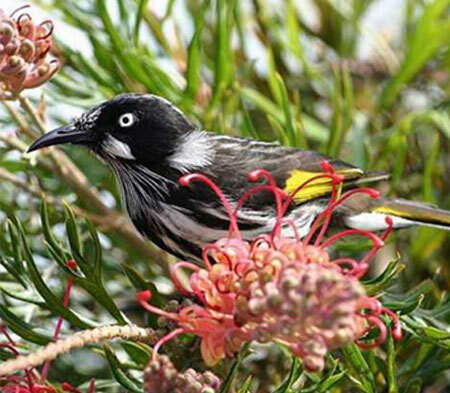 Both birds love Banksias and Eucalypt flowers, and insects. 26-28 cm. 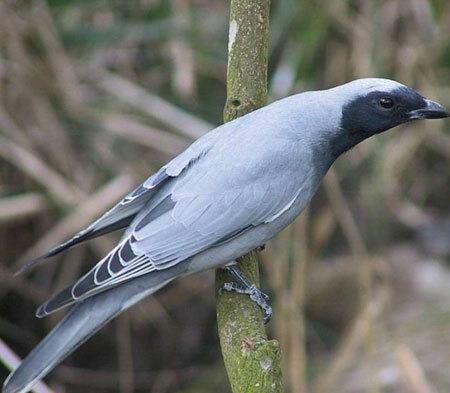 Striking black face and throat, pale grey body with darker grey wing tips. Most recognisable by its swift direct flight with closed wings. Voice: Musical, churring or a sharp ‘skair!’ in aggression. 15-19 cm. Greenish yellow with a white plume below its cheek. More likely to be seen near water. Voice: ‘che-uck-oo-whee’ and a loud ’ti-ti-ti’ in alarm. 22.5 cm An ordinary looking bird with an extraordinary song, very melodious; you will soon recognise its ‘pip pip pip pip hoo-ee’. We often hear it while we are working, especially along the Creek track. 8. 25-28 cm. 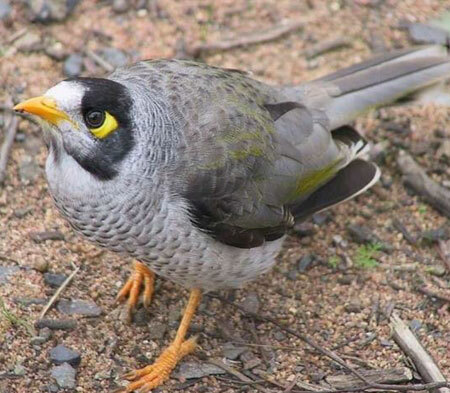 Although an indigenous bird the Noisy Miner is regarded with disapproval for its aggressive behaviour towards other birds. It often gathers in flocks and drives away any competition. Voice: A loud ‘zwit’ and a series of ‘weet, weet, weet’ as it flies. It can be quite melodic too. 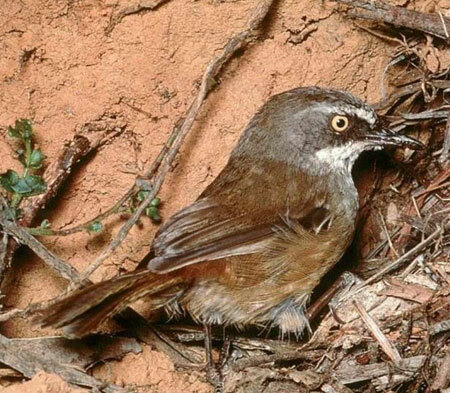 smaller than a magpie but similar in appearance,with a dark grey head, dull grey back, white throat and greyish underparts. Voice:beautiful, vigorous flute- like melodic piping. 38-44 cm. 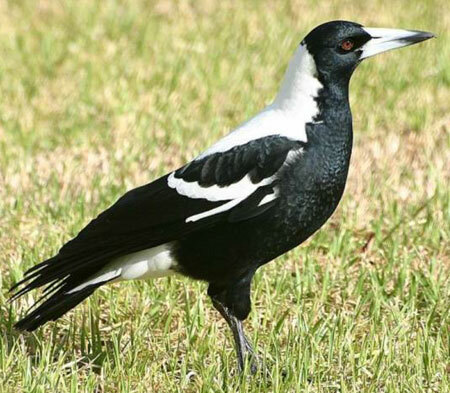 One of the most familiar Australian birds. 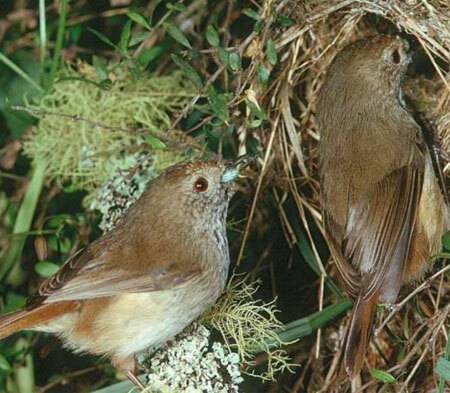 In spring they aggressively protect their nest sites by dive-bombing passers-by. Their raucous young constantly demand to be fed even as they reach the same size as their parents, and have mottled grey and white feathers which become the sharp black and white of the parents. Voice: A beautiful flute-like carolling, especially at dawn. 26-30 cm. Also known as Mud-Lark as it builds its nest of mud. An elegant little bird as it struts confidently around, often with its mate. 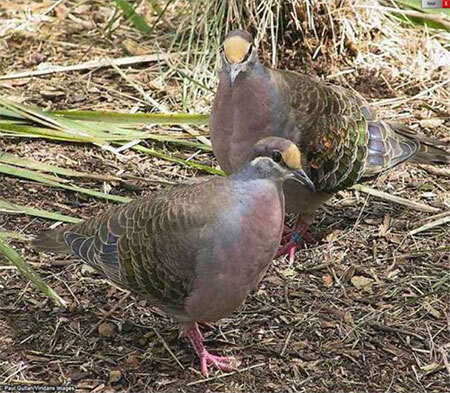 The male has a white eyebrow and a broader white patch below the eye than the female. Voice: A strident ‘pee wee’ (it’s other name) as well as a more melodic call. 13-16 cm. 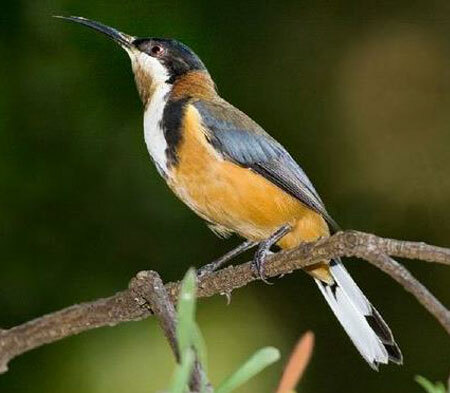 An exquisite tiny bird with black and chestnut colouring that loves to probe correas and other tubular flowers for nectar. Voice: A running ‘pip pip pip’. a low booming call, repeated at three minute intervals. Departs with a clatter of wings. Usually seen in pairs. 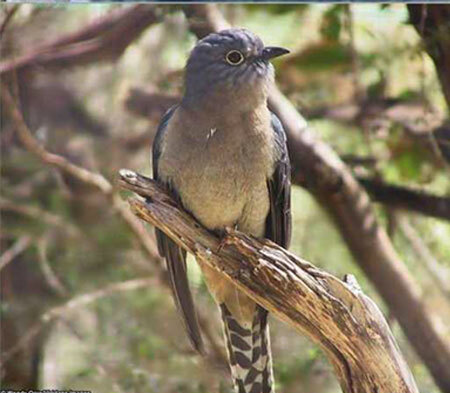 blue-grey cuckoo with dull chestnut breast and yellow eye-ring.Voice a far-carrying mournful trill with downward inflection–ph-ph-phew, ph-ph-phew. More commonly heard in spring. 11-13 cm. Distinctive white eyebrows and throat. A busy hunter in the undergrowth. Voice: A scissory, sneezy ‘tseer,’tseer’ or ‘sit-you, sit-you’. 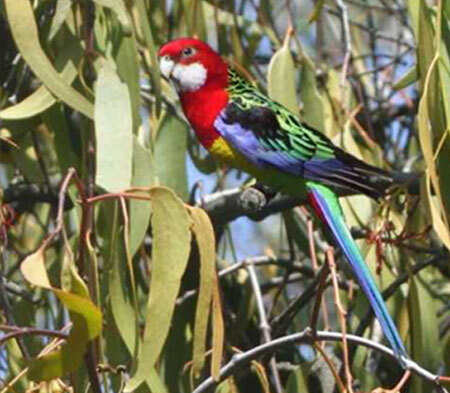 White-cheeked rosella with red head and breast,yellow underparts, black and yellow mottled back, blue shoulders.Like the Rainbow Lorikeet, it nests in tree hollows. 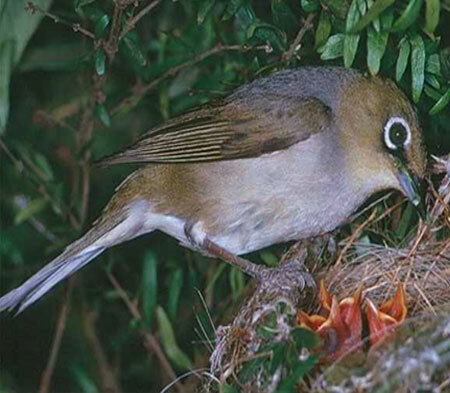 It eats fruit, nuts and seeds, often seen on lawns eating grass seed.Voice:a bell-like ‘pink, pink’ and soft chattering. golden breasted with a white throat and black ‘hood’, olive back with yellow edges to wing feathers.Voice:This is the Luciano Pavarotti of the woodland,with a lovely melodic whistle. yellow and black wings and boldly -striped black and white breast, yellow and black tail feathers; slender curved black beak. Voice:a loud ‘tchlik’ and a whistling ‘pseet’, shrill harsh chattering. 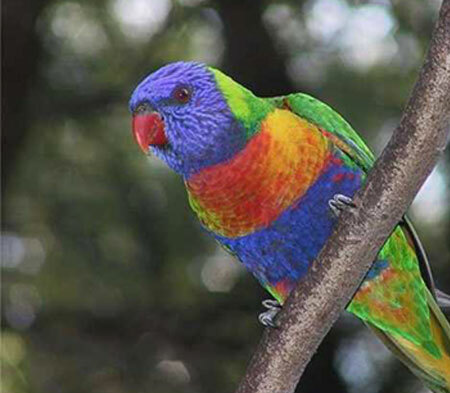 Large blue-headed lorikeet with orange or red breast. Often seen at the entrance to a hole high in a tree trunk,where it makes its nest. 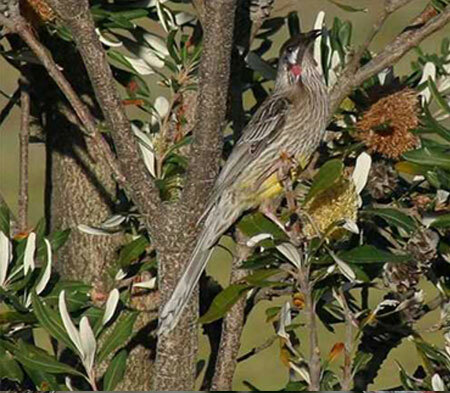 They feed on eucalypt and Banksia blossoms often in noisy flocks.Voice:a noisy screech while in flight, noisy chatter while feeding. 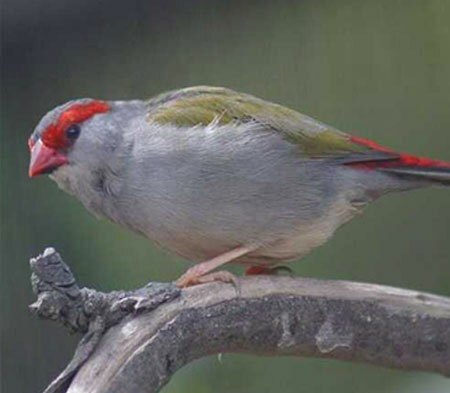 olive-backed with red ‘eyebrow’, grey underparts, red feathers at top of tail, then black. Commonly seen ina flock, often near water. Voice:high-pitched ‘pseet’. 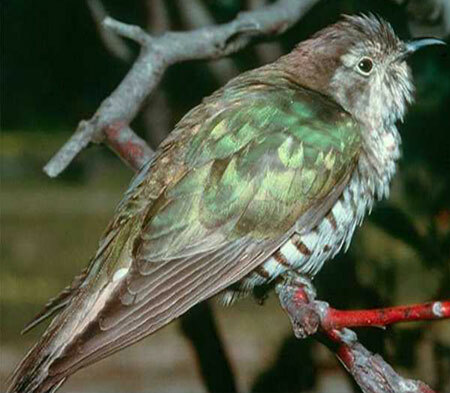 iridescent green bronze-cuckoo with bars on underparts extending to chin. Like the other cuckoos, heard but rarely seen.Voice:a series of whistles with an upward inflection, as if summoning ‘Here! 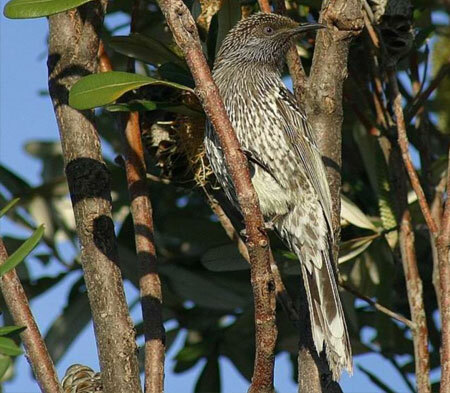 large wattlebird with yellow abdomen, small pendant red wattle below the ear; white tips on tail feathers. Swiftflight, catching insects in mid-air.Voice:noisy, ‘chock a lock’, like maniacal laughter! 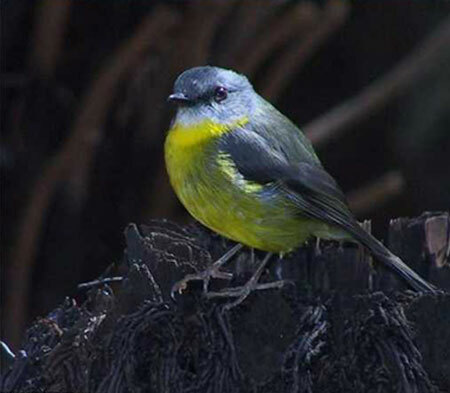 Tiny olive green bird with grey chest and a distinct ‘silver’ ring around its eyes. 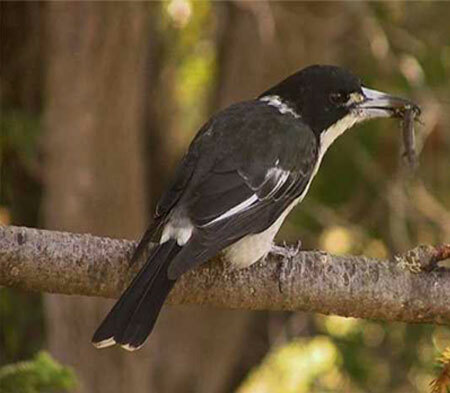 They feed on insects, nectar and fruit and usually move rapidly in flocks.Voice:a loud ‘tsee’. 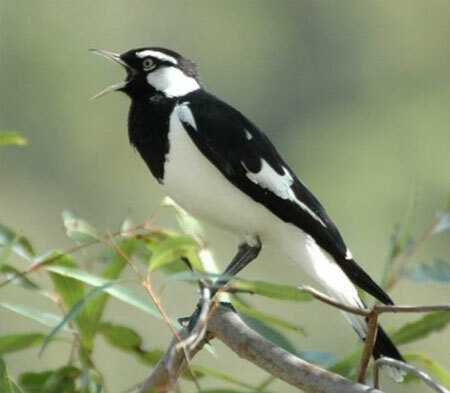 little bird,crown black with white spots, yellow throat and under tail. Digs a hole in an earth bank for a nest.Voice: high clear ‘sleep, peep’ rising to ‘deedee’. 13-15 cm. 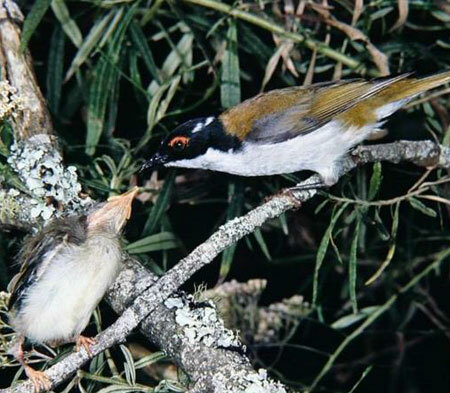 Small black-headed honeyeater with a white nape not meeting the eye, orange wattle over the eye, dull olive-green back, white chest. May move to Queensland in autumn. Voice: Soft ‘sherp, sherp’ or ‘tew, tew’. 15-18 cm. A black mask split by a yellow stripe below the eye. Also migrates in autumn, returns July-October Voice: Loud cheery ‘chick-up’ and ‘pirrup, pirrup’. 48-50 cm. 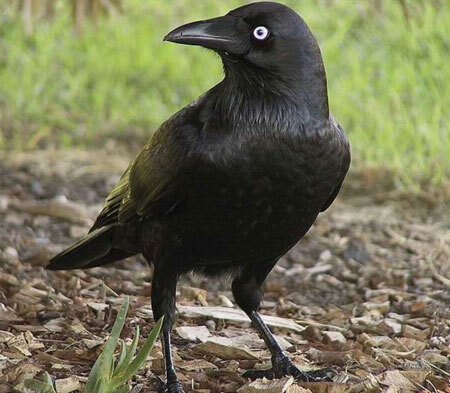 Often called ‘crow’ but is an Australian bird. Its cry is not as loud or long as the bigger Australian Raven. Also more insectivore than scavenger than the latter. 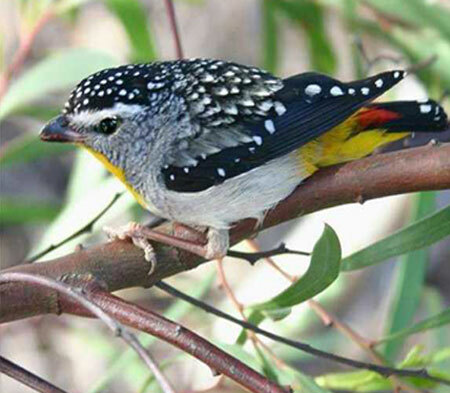 They roost communally and often fly in noisy groups. Voice: Harsh, short, rapid ‘car car car’. 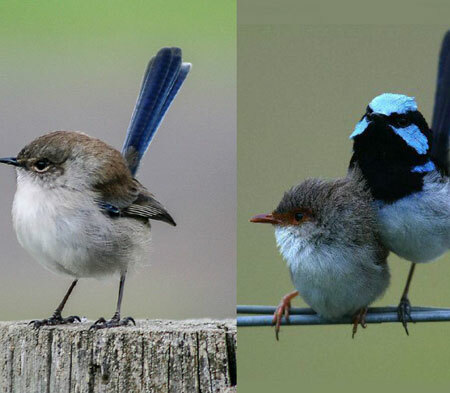 14 cm Female and juvenile male both greyish with blue tails. 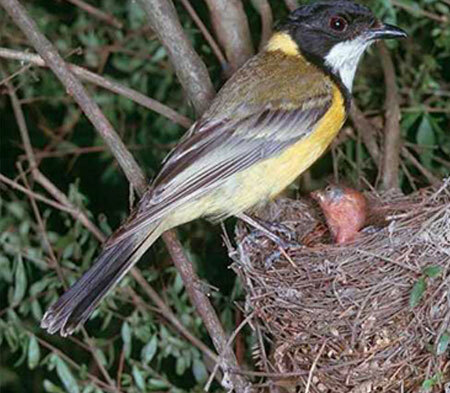 Adult male has all the colour but moults to grey after breeding season. Not commonly seen, prefer low vegetation, last sighted on Liddesdale track. Voice: Short sharp ‘trrrt’. 19-22 cm. 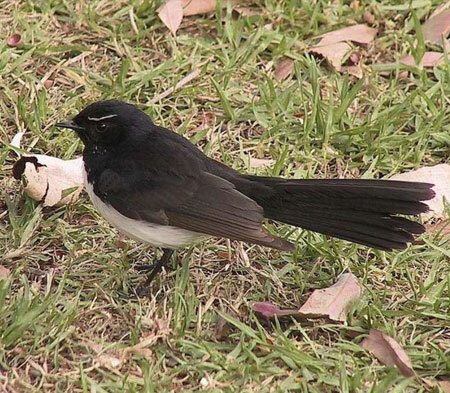 With its wagging fantail, cheeky white eyebrows and sharply defined black and white colouring the Willie Wagtail is a well-loved bird. 32-46 cm. A master of camouflage by day, it is hard to see him against the grey bark of a tree branch where the flimsy nest will be in spring*. 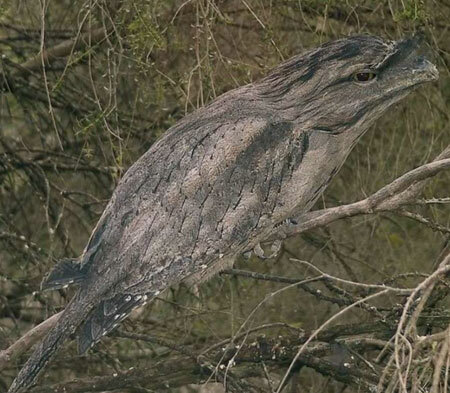 A nocturnal bird with a powerful frog-like beak, huge yellow eyes with a disconcerting stare if you should come face-to-face. We have some families in the reserve, but tree removal is a constant threat. Voice: A soft but penetrating ‘oom, oom’, usually heard in the early hours of the morning. 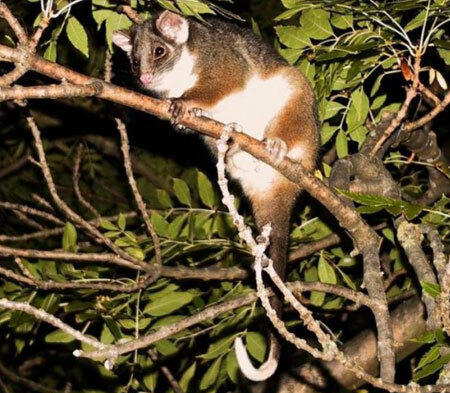 The Brushtail is the biggest possum – 35-55 cm with a 25-40 cm tail and weighs 1.2-4.5 kg. It is the noisiest with its screams, hisses and growls. 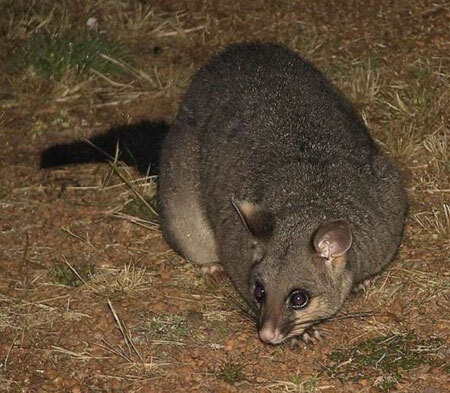 Babies born March –May, so all possums have young from autumn onwards into summer. The Ringtail is next in size – 30-35 cm plus the same length, prehensile, tail. Its call is a high-pitched ticking. Babies born April-December. 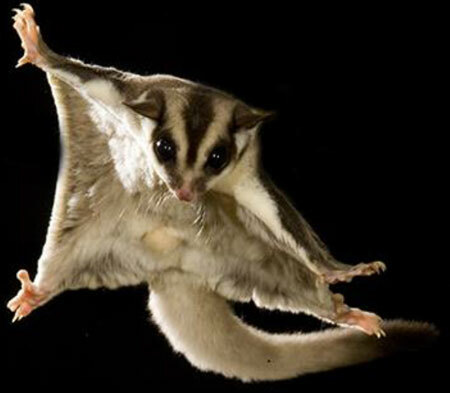 The Sugar Glider is the smallest with a 16-21 cm body and a tail the same length. 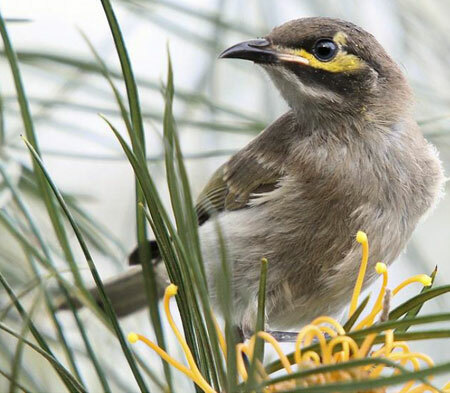 It is named for its love of the sugar exuding from wattles which it accesses by chewing or scratching grooves in the bark and of course for its gliding method of moving from tree to tree. Its babies are born in June-January. It has a soft dog-like yapping call. 70 mm. 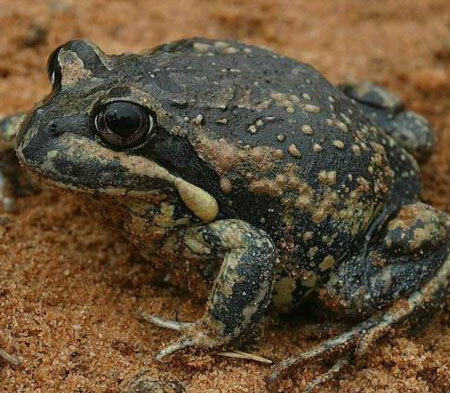 Large, thickset burrowing frog. Brown to grey brown with mottling on the back. Broad dark brown band behind the eyes to the flanks, raised pale brown stripe from beneath the eyes to the shoulders, underparts pale. Lays eggs August-January in pools and slow streams. Voice: Often called the ‘Pobblebonk’ because of its plucking resonant call.